← Why do Angelynn’s Jewelry Organizers cost more than most other jewelry organizers? My husband Robert and I and were living in a mobile home with our first child Asia and we were expecting our second child Sariea in March. He was working hard for Ericsson Telecommunications and I was working for a real estate appraiser part time. We sold our mobile home of 6 years and 3 locations in Rural Collin County and moved to a tiny condo in Plano, Texas. Robert and I were living in Plano and had 2 children. Our income levels were low and money was extremely tight and our outgoing was more than our incoming. I needed an answer. In prayer I asked Lord Jesus give me the solution. Immediately, I received divine inspiration….I saw a keyhole shape in my mind, I asked out loud, “What is it?” truly not knowing. The next thought I heard in my heart was “It is an Earring Organizer”. I ran downstairs to my kitchen and got a lid to a Parkay container and cut out the keyhole with a razor knife, and ran back upstairs and hung one of my earrings on it and thought WOW!!! The work began….lots of it. I came up with a business name “Golden Star Products” and filed for an assumed name. I then designed my own logo. From the very beginning and for many years I was told by almost everyone this was a pipe dream, a pie in the sky and that it would never sell or make a profit. I was totally on my own and started inventing. What would I make it out of? How big should I make it? What will it cost to make and can I sell it and make a profit? Who would buy it? How will they find out about it? I consulted with the Collin County Business Development Center who advised getting a prototype and other helpful information and started looking for a patent attorney. 1st Prototype – I went to a sheet metal shop to have them quote me a prototype made on a C& C machine. We did not have the money so I cut back on grocery shopping and in a couple of weeks I had enough to have them made. They were industrial looking, but they worked. I decided that acrylic or plastic was the way to go to be the most cost efficient. I researched injection molding. I made some drawings, one after another until I got it right. For months I was up until 2 a.m. or later working and fine tuning with pencil and pad. I knew that the free USPS Flat Rate Envelopes would save me money on shipping supplies so I stayed within those dimensions. Mind you this was before there was an internet or EBay, Amazon buying or selling online, I was thinking mail order. 2nd run of Prototypes – I ran my idea past a friend of mine who owned a sign shop in McKinney, David & Stephanie mentioned laser cutting sheet acrylic and referred me to someone. He made me about a dozen from some free scrap acrylic that he had and I paid him for his time out of grocery money and sold 6 of them immediately to friends for $20.00 each. Patent attorney costs were way more than I could afford. So it was either try to get a patent in the next 10 years or put it out there to see its possibilities. I decided to put it out there and worry about the patent later. I went to Precision Mold to get a quote. At that time mold prices were $12,000 to $14,200, now molds are doubled and even tripled in price. I had to pay in advance before they would machine the mold. Since January I tried to get financial backing from banks but they wanted collateral something I did not have. I asked friends & family but either did not have it or thought it was a pie in the sky. I got the phone book out and did a cold call survey of 200 women with pierced earrings and the results were great. 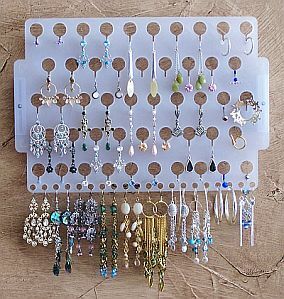 Of the 200 women 99.5% would definitely consider purchasing an acrylic earring organizer that was easy to use and wall mounted. 50% of them would spend $16.00 to $22.00, 20% would spend $23.00 to $30.00 and 30% $10.00 to $15.00. This was in 1991. I also did product comparisons, comparing the Earring Angel (Earring Board) to other earring organizers and researched mail order catalogs and ladies magazines to see about advertising costs etc. I designed mail order graphics and promotional pieces. This was before internet shopping, which became a true God Send for my business. Over this year I did a lot of research and searched for investors. I worked on research and presentation for a year. I was also shopping for a company that already had distribution and made injection mold items. I decided that once my research and presentation was refined I would contact several companies to see if they would be interested in buying my idea or manufacturing it and pay me royalties. Never having done anything like this before, I got out my electric typewriter and got to work. Don’t forget this was before the PC and the internet, a lot of literal copying with carbon paper and pasting. Only a few friends believed in the idea one of which was Alan he had a computer and knew how to use it. He and others helped with graphics, I would draw on paper and they would convert to the computer so I could have a more professional presentation. 3rd run of Prototypes – After searching, I finally found Questek Laser Machining in Richardson, Texas and spoke with Ed Case. I showed him my drawings and a sample. I need to get an idea of cost to get this thing rolling and they gave me a quote September 4th, I don’t remember the exact amount but it was over a thousand dollars for design, setup, tooling plus material. I thanked him for his time, knowing there was no way I could afford it but at least I had an idea of the cost to test market. However, as I was leaving I found the courage to ask him “Do you have any scrap acrylic sheet that you could use?” He said probably not, but that he would check. The next day he checked and they did have some scrap they could use. Then he proceeded to say that he thought the idea was so great and he wanted to give one his wife, and since the shop was so slow that week he decided to make me 75 of them for FREE! What a great guy! The following week I received the 75 Earring Angels. I had intended to sell them and use the money to make more, but it did not happen that way. This was very hard, but I knew in my heart that the right thing to do was to GIVE them away. That following Sunday at Church I gave most of them away, but I did keep a few as prototype samples. I received the best feedback from the ladies I gave them to, it was very encouraging. September 25, 1991 – I took an Earring Board (Earring Angel) to the Collin County Small Business Development Center with my drawings and market research. I had an appointment with the Manager Gil Blackman who was skeptical at first but then when he saw how it worked he took a deep breath and said “I will be right back”. He went and got the Director Chris Jones. When she came into the room I showed her how it worked. She also took a deep breath and asked me “Do you know what you have here?” I asked “What?” She said “VELCRO”. I thought I knew what she meant, but had to ask “What do you mean?” She went on to say “This is the next Velcro, everyone will want one once they see how it works”. I was blown away! They helped me create an “Offering Profile for The Earring Board” and notarized my drawings and notes and gave me some good advice and sent me on my way. I hired Texas A&M do a patent search for me. Patent search came up clear, there was nothing out there like it. I went to consult with the Collin County Small Business Development Center regarding estimating, accounting, international trade and getting a small business loan. I was told business loans without collateral would not happen. I found several possible candidates and decided to contact these companies to see if they would be interested in buying my idea or manufacturing it and pay me royalties. I made copies of photographs and assembled the final version of my presentations. July 7, 1992, I sent out 12 packets and 8 responded, three of which with great encouragement, however one seriously considered it. July 14, 1992, Louise & John Sylvester with Alliance Enterprises in Connecticut were the one. They signed my non-disclosure agreement and wanted a sample, so I sent them one. July 30, 1992, 4th run of Prototypes and First Stock – Louise sent me a letter stating that they wished me success with my product and that they had enough earring organizers in their product line, and that the cost to jumpstart a new product was extremely high and declined the opportunity. So I called her and we talked. She said that she loved the design but that the success of a wall mounted organizer was questionable, and the cost to get to production was very expensive. After talking for a while, even though I did not know her, I asked a rather forward question …. Louise would you consider praying about this, and ask God if you should do this for me? There was dead silence and I just held my breath, and then she said Yes, I will (ask God). She called me several days later and said “Yes, I will do this for you”. October 21, 1992, Louise and John signed the contractual agreement and they got to work making the mold, designing the packaging and adding my product to their catalog. They invested over $25,000 for the mold, graphics, packaging in 2 languages English and French and updating their catalog. I received my first samples of the Earring Angel (Earring Board) that was injection molded. They made 5000 and sold them to stores like, Claire’s Boutique, Afterthoughts and small private boutiques. Louise hired me to represent the entire line in Texas, and I did. I tried McKinney Trade Days with my good friend Isabel, but were rained out for the entire weekend. June 15, 1993, we moved out of our tiny condo and into our first house we rented and later purchased. Louise & John came to Dallas for a trade show in and we met for the first time face to face they asked me to work the trade show with them so I did. What wonderful people! She also had scheduled showings at JC Penney and the new Container Store that she asked me to accompany her and I did. Louise told me that my product was their #1 seller after only 30 days being in the market they sold out and were running a new batch of 5000 and how impressed she was. At this time we were expecting our 3rd child, Luke. I was receiving royalty checks regularly and only did limited sales rep work as they needed it. I was contacting several magazines about doing an editorial on the “Earring Board” for several months but with no takers. John and Louise encouraged me to change my assumed name from Golden Star Products to Alliance Enterprises, so I do so on December 10, 1993. During this winter Louise fell and broke her hip and she told me that she and her husband were considering retiring. Louise and John gave me a heads up that they were going to sell their business and retire in Florida. My son Luke was born. The company was in the process of being sold. The new buyer had no intention on manufacturing any of their jewelry organizers so Louise offered me their last recent run of 5,000 that they had just manufactured, but I would have to pay the freight. Not only did I not have the space to keep 5,000 Earring Angels (Earring Boards) I could not afford the freight. I paid to ship 2 cases/100 Earring Angels and they recycled the rest. July 18, 1994, Louise and John signed the rights to the mold over to me and encouraged me to make and sell them myself. She said it was a great product and in the short time they were making and selling them they outsold all their other earring holders combined. The mold was held in California at CB Molding. I called and spoke with Chris Barnes and we were good to go whenever I had the money. I tried over and over again to get an investor or loan but our income was too low to qualify and we had no collateral.